Athletic Bilbao, historically, are the third most successful football club in Spain. As well as being one of only three clubs never relegated from the top division of La Liga – there are no prizes for knowing the other two – they are also third in the number of titles won over the years. Sadly for their supporters the last title was won, along with the Copa del Rey, as far back as 1984. Founded in 1898 by a group of students from the Gymnasium Zamacois – who adopted the English spelling because they had studied in England – Athletic Bilbao merged with Bilbao Football Club, consisting of mainly ex miners from the north-east of England and shipyard workers from Portsmouth and Southampton, in 1902. After calling themselves Club Vizcaya for a season they reverted to the name Athletic Club de Bilbao in 1903. After playing in blue and white stripes for a few seasons, in 1910 they changed to the red and white they still play in today – the possible reasons for this can be found in the Atlético Madrid article, as the two clubs shared founders and have entwined early histories. 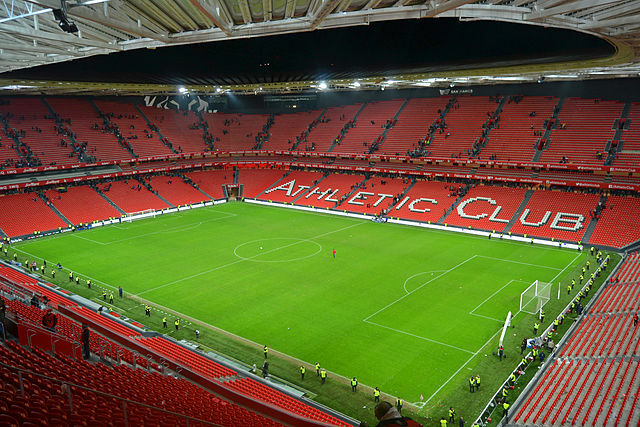 All of the games in Bilbao were played at the club’s present stadium, San Mamés, named after a nearby church. This has led to the stadium being known as ‘The Cathedral’, although the atmosphere – especially when Real Madrid are in town – can hardly be compared with one! As well as being known as the ‘Rojiblancos’ because of their colours the team is also referred to as ‘Los Leones’ (the lions) as St Mammes himself was an early Christian that the lions had refused to kill. Recent History: The only truly successful team of recent years was that assembled by Javier Clemente in the early 1980s, which included the famous goalkeeper Andoni Zubizarreta and the infamous, in British eyes anyway, Goikoetxea – the ‘Butcher of Bilbao’. This was the team that won the double in 1983/84. Since then the club has finished near the top of the table on a few occasions and has flirted with relegation more than once including 2006/07 when they only surivived on the last day of the season. One of the last clubs to sell the front of their shirt to sponsors – the Biscay-based Petronor Oil Company – Athletic Bilbao’s future is constantly under discussion. Their policy of “Con cantera y aficíon, no hace falta importación” (“With home-grown players and fans, you have no need of foreigners”) – has been questioned by some supporters. They feel that with only about three million Basques to choose from they have little chance of competing at the highest level. There remains, however, a significant number who consider that they would rather be relegated than give up their policy and sense of unique Basque identity. Evidence from the 2011/12 season suggests they have little to worry about as some quite superb football under Argentinian coach Marcelo Bielsa earned Athletic the runners-up spot in both the Copa del Rey in Spain and the Europa League in which they lost to Atlético Madrid in the final.